Acute kidney injury (AKI) is defined as an abrupt or rapid decline in renal filtration function. See the image below. Photomicrograph of a renal biopsy specimen shows renal medulla, which is composed mainly of renal tubules. Features suggesting acute tubular necrosis are the patchy or diffuse denudation of the renal tubular cells with loss of brush border (blue arrows); flattening of the renal tubular cells due to tubular dilation (orange arrows); intratubular cast formation (yellow arrows); and sloughing of cells, which is responsible for the formation of granular casts (red arrow). Finally, intratubular obstruction due to the denuded epithelium and cellular debris is evident (green arrow); note that the denuded tubular epithelial cells clump together because of rearrangement of intercellular adhesion molecules. Dietary changes are an important facet of AKI treatment. Restriction of salt and fluid becomes crucial in the management of oliguric renal failure, in which the kidneys do not adequately excrete either toxins or fluids. Pharmacologic treatment of AKI has been attempted on an empiric basis, with varying success rates. See Chronic Kidney Disease and Acute Tubular Necrosis for complete information on these topics. For information on pediatric cases, see Chronic Kidney Disease in Children. Patients who develop AKI can be oliguric or nonoliguric, can have a rapid or slow rise in creatinine levels, and may have qualitative differences in urine solute concentrations and cellular content. (Approximately 50-60% of all causes of AKI are nonoliguric.) This lack of a uniform clinical presentation reflects the variable nature of the injury. Classifying AKI as oliguric or nonoliguric on the basis of daily urine excretion has prognostic value. Oliguria is defined as a daily urine volume of less than 400 mL and has a worse prognosis. Anuria is defined as a urine output of less than 100 mL/day and, if abrupt in onset, suggests bilateral obstruction or catastrophic injury to both kidneys. Stratification of renal injury along these lines helps in diagnosis and decision-making (eg, timing of dialysis) and can be an important criterion for patient response to therapy. In 2004, the Acute Dialysis Quality Initiative work group set forth a definition and classification system for acute renal failure, described by the acronym RIFLE (Risk of renal dysfunction, Injury to the kidney, Failure or Loss of kidney function, and End-stage kidney disease). Investigators have since applied the RIFLE system to the clinical evaluation of AKI, although it was not originally intended for that purpose. AKI research increasingly uses RIFLE. See Table 1, below. Note: Patients can be classified by GFR criteria and/or UO criteria. The criteria that support the most severe classification should be used. The superimposition of acute on chronic failure is indicated with the designation RIFLE-FC; failure is present in such cases even if the increase in SCreat is less than 3-fold, provided that the new SCreat is greater than 4.0 mg/dL (350 µmol/L) and results from an acute increase of at least 0.5 mg/dL (44 µmol/L). When the failure classification is achieved by UO criteria, the designation of RIFLE-FO is used to denote oliguria. The initial stage, risk, has high sensitivity; more patients will be classified in this mild category, including some who do not actually have renal failure. Progression through the increasingly severe stages of RIFLE is marked by decreasing sensitivity and increasing specificity. AKIN has proposed a staging system for AKI that is modified from RIFLE. In this system, either serum creatinine or urine output criteria can be used to determine stage. See Table 2, below. *Patients who receive renal replacement therapy (RRT) are considered to have met the criteria for stage 3 irrespective of the stage they are in at the time of RRT. Pericarditis is a relatively rare complication of AKI. When pericarditis complicates AKI, consider additional diagnoses, such as systemic lupus erythematosus (SLE) and hepatorenal syndrome. AKI also can be a complication of cardiac diseases, such as endocarditis, decompensated heart failure, or atrial fibrillation with emboli. Cardiac arrest in a patient with AKI always should arouse suspicion of hyperkalemia. Many authors recommend a trial of intravenous calcium chloride (or gluconate) in all patients with AKI who experience cardiac arrest. Hypoxia commonly occurs during hemodialysis and can be particularly significant in the patient with pulmonary disease. This dialysis-related hypoxia is thought to occur secondary to white blood cell (WBC) lung sequestration and alveolar hypoventilation. Nausea, vomiting, and anorexia are frequent complications of AKI and represent one of the cardinal signs of uremia. GI bleeding occurs in approximately one third of patients with AKI. Most episodes are mild, but GI bleeding accounts for 3-8% of deaths in patients with AKI. Mild hyperamylasemia commonly is seen in AKI (2-3 times controls). Elevation of baseline amylase concentrations can complicate diagnosis of pancreatitis in patients with AKI. Measurement of lipase, which commonly is not elevated in AKI, often is necessary to make the diagnosis of pancreatitis. Pancreatitis has been reported as a concurrent illness with AKI in patients with atheroemboli, vasculitis, and sepsis from ascending cholangitis. Jaundice has been reported to complicate AKI in approximately 43% of cases. Etiologies of jaundice with AKI include hepatic congestion, blood transfusions, and sepsis. Infections commonly complicate the course of AKI and have been reported to occur in as many as 33% of patients with AKI. The most common sites of infection are the pulmonary and urinary tracts. Infections are the leading cause of morbidity and death in patients with AKI. Various studies have reported mortality rates of 11-72% in infections complicating AKI. Neurologic signs of uremia are a common complication of AKI and have been reported in approximately 38% of patients with AKI. Neurologic sequelae include lethargy, somnolence, reversal of the sleep-wake cycle, and cognitive or memory deficits. Focal neurologic deficits are rarely caused solely by uremia. The pathophysiology of neurologic symptoms is still unknown, but these symptoms do not correlate well to levels of BUN or creatinine. Also see Management of Acute Complications of Acute Renal Failure. Educating patients about the nephrotoxic potential of common therapeutic agents is always helpful. Nonsteroidal anti-inflammatory drugs (NSAIDs) provide a good example; most patients are unaware of their nephrotoxicity, and their universal availability makes them a constant concern. For patient education information, see the Diabetes Center, as well as Acute Kidney Failure. The driving force for glomerular filtration is the pressure gradient from the glomerulus to the Bowman space. Glomerular pressure depends primarily on renal blood flow (RBF) and is controlled by the combined resistances of renal afferent and efferent arterioles. Regardless of the cause of AKI, reductions in RBF represent a common pathologic pathway for decreasing glomerular filtration rate (GFR). The etiology of AKI consists of 3 main mechanisms: prerenal, intrinsic, and obstructive. In prerenal failure, GFR is depressed by compromised renal perfusion. Tubular and glomerular function remain normal. Intrinsic renal failure includes diseases of the kidney itself, predominantly affecting the glomerulus or tubule, which are associated with the release of renal afferent vasoconstrictors. Ischemic renal injury is the most common cause of intrinsic renal failure. Patients with chronic kidney disease may also present with superimposed AKI from prerenal failure and obstruction, as well as intrinsic renal disease. Obstruction of the urinary tract initially causes an increase in tubular pressure, which decreases the filtration driving force. This pressure gradient soon equalizes, and maintenance of a depressed GFR then depends on renal efferent vasoconstriction. Depressed RBF eventually leads to ischemia and cell death. This may happen before frank systemic hypotension is present and is referred to as normotensive ischemic AKI. The initial ischemic insult triggers a cascade of events, including production of oxygen free radicals, cytokines and enzymes; endothelial activation and leukocyte adhesion; activation of coagulation; and initiation of apoptosis. These events continue to cause cell injury even after restoration of RBF. 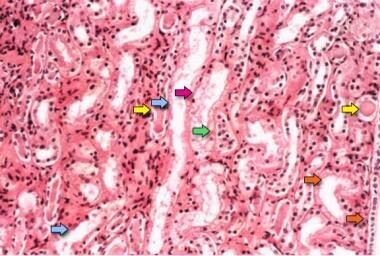 Tubular cellular damage results in disruption of tight junctions between cells, allowing back leak of glomerular filtrate and further depressing effective GFR. In addition, dying cells slough off into the tubules, forming obstructing casts, which further decrease GFR and lead to oliguria. Although these changes are observed predominantly in proximal tubules, injury to the distal nephron can also be demonstrated. In addition, the distal nephron may become obstructed by desquamated cells and cellular debris. See the image above. In contrast to necrosis, the principal site of apoptotic cell death is the distal nephron. During the initial phase of ischemic injury, loss of integrity of the actin cytoskeleton leads to flattening of the epithelium, with loss of the brush border, loss of focal cell contacts, and subsequent disengagement of the cell from the underlying substratum. Many endogenous growth factors that participate in the process of regeneration following ischemic renal injury have not been identified. However, administration of growth factors exogenously has been shown to ameliorate and hasten recovery from AKI. Depletion of neutrophils and blockage of neutrophil adhesion reduce renal injury following ischemia, indicating that the inflammatory response is responsible, in part, for some features of ATN, especially in postischemic injury after transplant. Intrarenal vasoconstriction is the dominant mechanism for reduced GFR in patients with ATN. The mediators of this vasoconstriction are unknown, but tubular injury seems to be an important concomitant finding. Urine backflow and intratubular obstruction (from sloughed cells and debris) are causes of reduced net ultrafiltration. The importance of this mechanism is highlighted by the improvement in renal function that follows relief of such intratubular obstruction. In addition, when obstruction is prolonged, intrarenal vasoconstriction is prominent in part due to the tubuloglomerular feedback mechanism, which is thought to be mediated by adenosine and activated when there is proximal tubular damage and the macula densa is presented with increased chloride load. Apart from the increase in basal renal vascular tone, the stressed renal microvasculature is more sensitive to potentially vasoconstrictive drugs and otherwise-tolerated changes in systemic blood pressure. The vasculature of the injured kidney has an impaired vasodilatory response and loses its autoregulatory behavior. This latter phenomenon has important clinical relevance because the frequent reduction in systemic pressure during intermittent hemodialysis may provoke additional damage that can delay recovery from ATN. Often, injury results in atubular glomeruli, where the glomerular function is preserved, but the lack of tubular outflow precludes its function. A physiologic hallmark of ATN is a failure to maximally dilute or concentrate urine (isosthenuria). This defect is not responsive to pharmacologic doses of vasopressin. The injured kidney fails to generate and maintain a high medullary solute gradient, because the accumulation of solute in the medulla depends on normal distal nephron function. Failure to excrete concentrated urine even in the presence of oliguria is a helpful diagnostic clue in distinguishing prerenal from intrinsic renal disease. In prerenal azotemia, urine osmolality is typically more than 500 mOsm/kg, whereas in intrinsic renal disease, urine osmolality is less than 300 mOsm/kg. Recovery from AKI is first dependent upon restoration of RBF. Early RBF normalization predicts better prognosis for recovery of renal function. In prerenal failure, restoration of circulating blood volume is usually sufficient. Rapid relief of urinary obstruction in postrenal failure results in a prompt decrease of vasoconstriction. With intrinsic renal failure, removal of tubular toxins and initiation of therapy for glomerular diseases decreases renal afferent vasoconstriction. Once RBF is restored, the remaining functional nephrons increase their filtration and eventually undergo hypertrophy. GFR recovery depends on the size of this remnant nephron pool. If the number of remaining nephrons is below a critical threshold, continued hyperfiltration results in progressive glomerular sclerosis, eventually leading to increased nephron loss. A vicious cycle ensues; continued nephron loss causes more hyperfiltration until complete renal failure results. This has been termed the hyperfiltration theory of renal failure and explains the scenario in which progressive renal failure is frequently observed after apparent recovery from AKI. Prerenal AKI represents the most common form of kidney injury and often leads to intrinsic AKI if it is not promptly corrected. Volume loss can provoke this syndrome; the source of the loss may be GI, renal, or cutaneous (eg, burns) or from internal or external hemorrhage. Prerenal AKI can also result from decreased renal perfusion in patients with heart failure or shock (eg, sepsis, anaphylaxis). Several classes of medications can induce prerenal AKI in volume-depleted states, including ACE inhibitors and angiotensin receptor blockers (ARBs), which are otherwise safely tolerated and beneficial in most patients with chronic kidney disease. Aminoglycosides, amphotericin B, and radiologic contrast agents may also do so. Renal arterial diseases that can result in AKI include renal arterial stenosis, especially in the setting of hypotension or initiation of ACE inhibitors or ARBs. Renal artery stenosis typically results from atherosclerosis or fibromuscular dysplasia, but is also a feature of the genetic syndromes type 1 neurofibromatosis, Williams syndrome, and Alagille syndrome. Patients can also develop septic embolic disease (eg, from endocarditis) or cholesterol emboli, often as a result of instrumentation or cardiovascular surgery. Structural injury in the kidney is the hallmark of intrinsic AKI; the most common form is ATN, either ischemic or cytotoxic. Glomerulonephritis can be a cause of AKI and usually falls into a class referred to as rapidly progressive (RP) glomerulonephritis. Glomerular crescents (glomerular injury) are found in RP glomerulonephritis on biopsy; if more than 50% of glomeruli contain crescents, this usually results in a significant decline in renal function. Although comparatively rare, acute glomerulonephritides should be part of the diagnostic consideration in cases of AKI. If the site of obstruction is unilateral, then a rise in the serum creatinine level may not be apparent, because of preserved function of the contralateral kidney. Nevertheless, even with unilateral obstruction a significant loss of GFR occurs, and patients with partial obstruction may develop progressive loss of GFR if the obstruction is not relieved. Bilateral obstruction is usually a result of prostate enlargement or tumors in men and urologic or gynecologic tumors in women. Patients who develop anuria typically have obstruction at the level of the bladder or downstream to it. Congenital malformations of the urinary collecting systems should be suspected in cases of postrenal AKI. In children, gastroenteritis is the most common cause of hypovolemia and can result in prerenal AKI. Congenital and acquired heart diseases are also important causes of decreased renal perfusion in this age group. The most common form of HUS is associated with a diarrheal prodrome caused by Escherichia coli O157:H7. These children usually present with microangiopathic anemia, thrombocytopenia, colitis, mental status changes, and renal failure. The prognosis for patients with AKI is directly related to the cause of renal failure and, to a great extent, to the presence or absence of preexisting kidney disease (estimated GFR [eGFR] < 60 mL/min), as well as to the duration of renal dysfunction prior to therapeutic intervention. In the past, AKI was thought to be completely reversible, but long-term follow-up of patients with this condition has shown otherwise. A study from Canada showed a much higher incidence of AKI than did previous reports, with a rate of 18.3% (7856 of 43,008) in hospitalized patients. The incidence of AKI correlated inversely with eGFR and was associated with a higher mortality rate and a higher incidence of subsequent end-stage renal disease (ESRD) at each level of baseline eGFR. If AKI is defined by a sudden increment of serum creatinine of 0.5-1 mg/dL and is associated with a mild to moderate rise in creatinine, the prognosis tends to be worse. (Increments of 0.3 mg/dL in serum creatinine, especially at lower ranges of serum creatinine, have important prognostic significance). In addition, the pooled estimate for general ICU patients with AKI shows a stepwise increase in relative risk for death through the risk, injury, and failure classifications of the RIFLE criteria in AKI patients versus non-AKI patients. This reflects the fact that the high mortality rate in patients with AKI who require dialysis may not be related to the dialysis procedure or accompanying comorbidities and that AKI is an independent indicator of mortality. The survival rate is nearly 0% among patients with AKI who have an Acute Physiology and Chronic Health Evaluation II (APACHE II) score higher than 40. In patients with APACHE II scores of 10-19, the survival rate is 40%. Prerenal azotemia from volume contraction is treated with volume expansion; if left untreated for a prolonged period, tubular necrosis may result and may not be reversible. Postrenal AKI, if left untreated for a long time, also may result in irreversible renal damage. Procedures such as catheter placement, lithotripsy, prostatectomy, stent placement, and percutaneous nephrostomy can help to prevent permanent renal damage. Timely identification of pyelonephritis, proper treatment, and further prevention using prophylactic antibiotics may improve the prognosis, especially in females. Early diagnosis of crescentic glomerulonephritis via renal biopsy and other appropriate tests may enhance early renal recovery, because appropriate therapy can be initiated promptly and aggressively. The number of crescents, the type of crescents (ie, cellular vs fibrous), and the serum creatinine level at the time of presentation may dictate prognosis for renal recovery in these patients. Schrier RW, Wang W, Poole B, Mitra A. Acute renal failure: definitions, diagnosis, pathogenesis, and therapy. J Clin Invest. 2004 Jul. 114(1):5-14. [Medline]. [Full Text]. Bellomo R, Ronco C, Kellum JA, Mehta RL, Palevsky P. Acute renal failure - definition, outcome measures, animal models, fluid therapy and information technology needs: the Second International Consensus Conference of the Acute Dialysis Quality Initiative (ADQI) Group. Crit Care. 2004 Aug. 8(4):R204-12. [Medline]. [Full Text]. Mehta RL, Kellum JA, Shah SV, Molitoris BA, Ronco C, Warnock DG, et al. Acute Kidney Injury Network: report of an initiative to improve outcomes in acute kidney injury. Crit Care. 2007. 11(2):R31. [Medline]. [Full Text]. Ronco C, Haapio M, House AA, Anavekar N, Bellomo R. Cardiorenal syndrome. J Am Coll Cardiol. 2008 Nov 4. 52(19):1527-39. [Medline]. Durand F, Graupera I, Ginès P, Olson JC, Nadim MK. Pathogenesis of Hepatorenal Syndrome: Implications for Therapy. Am J Kidney Dis. 2015 Oct 21. [Medline]. Rennie TJW, De Souza N, Donnan PT, Marwick CA, Davey P, Dreischulte T, et al. Risk of acute kidney injury following community prescription of antibiotics: self-controlled case series. Nephrol Dial Transplant. 2018 Jun 28. [Medline]. Talving P, Karamanos E, Skiada D, Lam L, Teixeira PG, Inaba K, et al. Relationship of creatine kinase elevation and acute kidney injury in pediatric trauma patients. J Trauma Acute Care Surg. 2013 Mar. 74(3):912-6. [Medline]. Mancini E, Caramelli F, Ranucci M, et al. Is time on cardiopulmonary bypass during cardiac surgery associated with acute kidney injury requiring dialysis?. Hemodial Int. 2011 Nov 8. [Medline]. Kheterpal S, Tremper KK, Heung M, Rosenberg AL, Englesbe M, Shanks AM, et al. Development and validation of an acute kidney injury risk index for patients undergoing general surgery: results from a national data set. Anesthesiology. 2009 Mar. 110(3):505-15. [Medline]. Goldberg R, Dennen P. Long-term outcomes of acute kidney injury. Adv Chronic Kidney Dis. 2008 Jul. 15(3):297-307. [Medline]. Panek R, Tennankore KK, Kiberd BA. Incidence, Etiology and Significance of Acute Kidney Injury in the Early Post Kidney Transplant Period. Clin Transplant. 2015 Oct 24. [Medline]. Holmes J, Rainer T, Geen J, Roberts G, May K, Wilson N, et al. Acute Kidney Injury in the Era of the AKI E-Alert. Clin J Am Soc Nephrol. 2016 Oct 28. [Medline]. Feest TG, Mistry CD, Grimes DS, Mallick NP. Incidence of advanced chronic renal failure and the need for end stage renal replacement treatment. BMJ. 1990 Oct 20. 301(6757):897-900. [Medline]. [Full Text]. Pannu N, James M, Hemmelgarn BR, Dong J, Tonelli M, Klarenbach S. Modification of Outcomes After Acute Kidney Injury by the Presence of CKD. Am J Kidney Dis. 2011 Aug. 58(2):206-13. [Medline]. Wang AY, Bellomo R, Cass A, Finfer S, Gattas D, Myburgh J, et al. Health-related quality of life in survivors of acute kidney injury: The Prolonged Outcomes Study of the Randomized Evaluation of Normal versus Augmented Level Replacement Therapy study outcomes. Nephrology (Carlton). 2015 Jul. 20 (7):492-8. [Medline]. Uchino S, Kellum JA, Bellomo R, Doig GS, Morimatsu H, Morgera S, et al. Acute renal failure in critically ill patients: a multinational, multicenter study. JAMA. 2005 Aug 17. 294(7):813-8. [Medline]. Bagshaw SM, Uchino S, Bellomo R, Morimatsu H, Morgera S, Schetz M, et al. Septic acute kidney injury in critically ill patients: clinical characteristics and outcomes. Clin J Am Soc Nephrol. 2007 May. 2(3):431-9. [Medline]. Ricci Z, Cruz D, Ronco C. The RIFLE criteria and mortality in acute kidney injury: A systematic review. Kidney Int. 2008 Mar. 73(5):538-46. [Medline]. Grams ME, Estrella MM, Coresh J, Brower RG, Liu KD. Fluid Balance, Diuretic Use, and Mortality in Acute Kidney Injury. Clin J Am Soc Nephrol. 2011 May. 6(5):966-973. [Medline]. [Full Text]. James MT, Hemmelgarn BR, Wiebe N, Pannu N, Manns BJ, Klarenbach SW, et al. Glomerular filtration rate, proteinuria, and the incidence and consequences of acute kidney injury: a cohort study. Lancet. 2010 Dec 18. 376(9758):2096-103. [Medline]. Wahl TS, Graham LA, Morris MS, Richman JS, Hollis RH, Jones CE, et al. Association Between Preoperative Proteinuria and Postoperative Acute Kidney Injury and Readmission. JAMA Surg. 2018 Jul 3. e182009. [Medline]. Philips B, MacPhee I. Do statins prevent acute kidney injury?. Expert Opin Drug Saf. 2015 Oct. 14 (10):1547-61. [Medline]. Dormuth CR, Hemmelgarn BR, Paterson JM, James MT, Teare GF, Raymond CB, et al. Use of high potency statins and rates of admission for acute kidney injury: multicenter, retrospective observational analysis of administrative databases. BMJ. 2013 Mar 18. 346:f880. [Medline]. [Full Text]. Giacoppo D, Capodanno D, Capranzano P, Aruta P, Tamburino C. Meta-analysis of randomized controlled trials of preprocedural statin administration for reducing contrast-induced acute kidney injury in patients undergoing coronary catheterization. Am J Cardiol. 2014 Aug 15. 114 (4):541-8. [Medline]. Marenzi G, Cosentino N, Werba JP, Tedesco CC, Veglia F, Bartorelli AL. A meta-analysis of randomized controlled trials on statins for the prevention of contrast-induced acute kidney injury in patients with and without acute coronary syndromes. Int J Cardiol. 2015 Mar 15. 183:47-53. [Medline]. Molnar AO, Coca SG, Devereaux PJ, Jain AK, Kitchlu A, Luo J, et al. Statin use associates with a lower incidence of acute kidney injury after major elective surgery. J Am Soc Nephrol. 2011 May. 22(5):939-46. [Medline]. [Full Text]. Pan SY, Wu VC, Huang TM, Chou HC, Ko WJ, Wu KD, et al. Effect of preoperative statin therapy on postoperative acute kidney injury in patients undergoing major surgery: systemic review and meta-analysis. Nephrology (Carlton). 2014 Dec. 19 (12):750-63. [Medline]. Lewicki M, Ng I, Schneider AG. HMG CoA reductase inhibitors (statins) for preventing acute kidney injury after surgical procedures requiring cardiac bypass. Cochrane Database Syst Rev. 2015 Mar 11. 3:CD010480. [Medline]. Kuhn EW, Slottosch I, Wahlers T, Liakopoulos OJ. Preoperative statin therapy for patients undergoing cardiac surgery. Cochrane Database Syst Rev. 2015 Aug 13. 8:CD008493. [Medline]. Wang J, Gu C, Gao M, Yu W, Yu Y. Preoperative Statin Therapy and Renal Outcomes After Cardiac Surgery: A Meta-analysis and Meta-regression of 59,771 Patients. Can J Cardiol. 2015 Aug. 31 (8):1051-60. [Medline]. Gallagher M, Cass A, Bellomo R, Finfer S, Gattas D, Lee J, et al. Long-term survival and dialysis dependency following acute kidney injury in intensive care: extended follow-up of a randomized controlled trial. PLoS Med. 2014 Feb. 11(2):e1001601. [Medline]. [Full Text]. [Guideline] National Clinical Guideline Centre (UK). Acute Kidney Injury: Prevention, Detection and Management Up to the Point of Renal Replacement Therapy. 2013 Aug. [Medline]. [Full Text]. Billings FT 4th, Pretorius M, Schildcrout JS, Mercaldo ND, Byrne JG, Ikizler TA, et al. Obesity and oxidative stress predict AKI after cardiac surgery. J Am Soc Nephrol. 2012 Jul. 23 (7):1221-8. [Medline]. [Full Text]. Kelz RR, Reinke CE, Zubizarreta JR, Wang M, Saynisch P, Even-Shoshan O, et al. Acute kidney injury, renal function, and the elderly obese surgical patient: a matched case-control study. Ann Surg. 2013 Aug. 258 (2):359-63. [Medline]. [Full Text]. Soto GJ, Frank AJ, Christiani DC, Gong MN. Body mass index and acute kidney injury in the acute respiratory distress syndrome. Crit Care Med. 2012 Sep. 40 (9):2601-8. [Medline]. [Full Text]. American College of Radiology. ACR Appropriateness Criteria® renal failure. National Guideline Clearinghouse. Available at http://guideline.gov/content.aspx?id=13685. Accessed: March 24, 2011. Koyner JL, Davison DL, Brasha-Mitchell E, Chalikonda DM, Arthur JM, Shaw AD, et al. Furosemide Stress Test and Biomarkers for the Prediction of AKI Severity. J Am Soc Nephrol. 2015 Aug. 26 (8):2023-31. [Medline]. [Full Text]. Chawla LS, Davison DL, Brasha-Mitchell E, Koyner JL, Arthur JM, Shaw AD, et al. Development and standardization of a furosemide stress test to predict the severity of acute kidney injury. Crit Care. 2013 Sep 20. 17 (5):R207. [Medline]. [Full Text]. Lowes R. FDA OKs NephroCheck to Assess Risk for Acute Kidney Injury. Medscape Medical News. Sep 5 2014. [Full Text]. Tuladhar SM, Püntmann VO, Soni M, Punjabi PP, Bogle RG. Rapid detection of acute kidney injury by plasma and urinary neutrophil gelatinase-associated lipocalin after cardiopulmonary bypass. J Cardiovasc Pharmacol. 2009 Mar. 53(3):261-6. [Medline]. Breidthardt T, Christ-Crain M, Stolz D, et al. A combined cardiorenal assessment for the prediction of acute kidney injury in lower respiratory tract infections. Am J Med. 2012 Feb. 125(2):168-75. [Medline]. Hall IE, Coca SG, Perazella MA, et al. Risk of Poor Outcomes with Novel and Traditional Biomarkers at Clinical AKI Diagnosis. Clin J Am Soc Nephrol. 2011 Dec. 6(12):2740-9. [Medline]. Spahillari A, Parikh CR, Sint K, Koyner JL, Patel UD et al. Serum cystatin C- versus creatinine-based definitions of acute kidney injury following cardiac surgery: a prospective cohort study. Am J Kidney Dis. 2012 Dec. 60(6):922-9. [Medline]. [Full Text]. Nainggolan L. Two Antihypertensives Plus NSAID Ups Risk of Acute Kidney Injury. Two Antihypertensives Plus NSAID Ups Risk of Acute Kidney Injury. Heartwire. Jan 9 2013. [Full Text]. Lapi F, Azoulay L, Yin H, Nessim SJ, Suissa S. Concurrent use of diuretics, angiotensin converting enzyme inhibitors, and angiotensin receptor blockers with non-steroidal anti-inflammatory drugs and risk of acute kidney injury: nested case-control study. BMJ. 2013 Jan 8. 346:e8525. [Medline]. [Full Text]. Hammoud K, Brimacombe M, Yu A, Goodloe N, Haidar W, El Atrouni W. Vancomycin Trough and Acute Kidney Injury: A Large Retrospective, Cohort Study. Am J Nephrol. 2016 Oct 28. 44 (6):456-461. [Medline]. Lauschke A, Teichgräber UK, Frei U, Eckardt KU. Low-dose' dopamine worsens renal perfusion in patients with acute renal failure. Kidney Int. 2006 May. 69(9):1669-74. [Medline]. Macedo E, Mehta RL. When should renal replacement therapy be initiated for acute kidney injury?. Semin Dial. 2011 Mar-Apr. 24(2):132-7. [Medline]. Palevsky PM, Zhang JH, O'Connor TZ, Chertow GM, Crowley ST, Choudhury D, et al. Intensity of renal support in critically ill patients with acute kidney injury. N Engl J Med. 2008 Jul 3. 359(1):7-20. [Medline]. [Full Text]. Pannu N, Manns B, Lee H, Tonelli M. Systematic review of the impact of N-acetylcysteine on contrast nephropathy. Kidney Int. 2004 Apr. 65(4):1366-74. [Medline]. Marenzi G, Assanelli E, Marana I, Lauri G, Campodonico J, Grazi M, et al. N-acetylcysteine and contrast-induced nephropathy in primary angioplasty. N Engl J Med. 2006 Jun 29. 354(26):2773-82. [Medline]. Majumdar SR, Kjellstrand CM, Tymchak WJ, Hervas-Malo M, Taylor DA, Teo KK. Forced euvolemic diuresis with mannitol and furosemide for prevention of contrast-induced nephropathy in patients with CKD undergoing coronary angiography: a randomized controlled trial. Am J Kidney Dis. 2009 Oct. 54 (4):602-9. [Medline]. Yang B, Xu J, Xu F, Zou Z, Ye C, Mei C, et al. Intravascular administration of mannitol for acute kidney injury prevention: a systematic review and meta-analysis. PLoS One. 2014 Jan 14. 9 (1):e85029. [Medline]. [Full Text]. Chorin E, Ben-Assa E, Konigstein M, Rofe MT, Hochstadt A, Galli N, et al. Prevention of post procedural acute kidney injury in the catheterization laboratory in a real-world population. Int J Cardiol. 2016 Oct 11. 226:42-47. [Medline]. Briguori C. Renalguard system in high-risk patients for contrast-induced acute kidney injury. Minerva Cardioangiol. 2012 Jun. 60 (3):291-7. [Medline]. Briguori C, Visconti G, Focaccio A, Airoldi F, Valgimigli M, Sangiorgi GM, et al. Renal Insufficiency After Contrast Media Administration Trial II (REMEDIAL II): RenalGuard System in high-risk patients for contrast-induced acute kidney injury. Circulation. 2011 Sep 13. 124 (11):1260-9. [Medline]. Preventing Acute Kidney Disease. RenalGuard. Available at http://www.renalguard.com/. Accessed: November 1, 2016. Zarbock A, Schmidt C, Van Aken H, Wempe C, Martens S, Zahn PK, et al. Effect of remote ischemic preconditioning on kidney injury among high-risk patients undergoing cardiac surgery: a randomized clinical trial. JAMA. 2015 Jun 2. 313 (21):2133-41. [Medline]. Zacharias M, Mugawar M, Herbison GP, Walker RJ, Hovhannisyan K, Sivalingam P, et al. Interventions for protecting renal function in the perioperative period. Cochrane Database Syst Rev. 2013 Sep 11. 9:CD003590. [Medline]. Ho KM, Morgan DJ. Meta-analysis of N-acetylcysteine to prevent acute renal failure after major surgery. Am J Kidney Dis. 2009 Jan. 53(1):33-40. [Medline]. Boggs W. Poor Long-Term Survival After ICU Acute Kidney Injury. Medscape Medical News. Available at http://www.medscape.com/viewarticle/822384.. Accessed: April 1, 2014. Acute kidney injury associated with synthetic cannabinoid use--multiple states, 2012. MMWR Morb Mortal Wkly Rep. 2013 Feb 15. 62(6):93-8. [Medline]. Gandhi S, Fleet JL, Bailey DG, et al. Calcium-Channel Blocker–Clarithromycin Drug Interactions and Acute Kidney Injury. JAMA. Nov 2013. [Full Text]. Melville N. Antibiotic and Calcium-Channel Blocker a Fatal Combination. Medscape Medical News. Available at http://www.medscape.com/viewarticle/814306. Accessed: November 20, 2013.
van der Wilden GM, Velmahos GC, Joseph DK, Jacobs L, Debusk MG, Adams CA, et al. Successful Nonoperative Management of the Most Severe Blunt Renal Injuries: A Multicenter Study of the Research Consortium of New England Centers for Trauma. JAMA Surg. 2013 Aug 14. [Medline]. Danziger J, Chen KP, Lee J, Feng M, Mark RG, Celi LA, et al. Obesity, Acute Kidney Injury, and Mortality in Critical Illness. Crit Care Med. 2015 Oct 22. [Medline]. Pigmented, muddy brown, granular casts are visible in the urine sediment of a patient with acute tubular necrosis (400x magnification). Disclosure: Serve(d) as a director, officer, partner, employee, advisor, consultant or trustee for: American Society of Nephrology<br/>Received income in an amount equal to or greater than $250 from: Healthcare Quality Strategies, Inc<br/>Received grant/research funds from Dept of Veterans Affairs for research; Received salary from American Society of Nephrology for asn council position; Received salary from University of Louisville for employment; Received salary from University of Louisville Physicians for employment; Received contract payment from American Physician Institute for Advanced Professional Studies, LLC for independent contractor; Received contract payment from Healthcare Quality Strategies, Inc for independent cont. Bacterial Skin Infections: Can You Make the Diagnosis? Diets for Patients With CKD: What's New, What's Best?